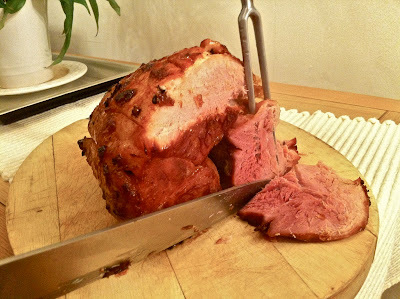 Around Christmas time is usually when I'm tempted with pictures of glazed hams, but then I thought why not have a roast ham any time of year? Having spent many festive holidays reading up on the best ways to cook and glaze a ham I think I've found a way that really works. My favourite thing about this is that you can prepare it in advance and have lots of lovely cold ham sitting in the fridge ready for sandwiches or to invent new recipes with. Top tip: Spending time initially, like a good Sunday afternoon will save time on many tasty mid-week dinners. 1. Get a large pan, and place the ham inside. Fill with water so the ham is covered completely and bring to the boil. Once boiling, remove from the heat and drain (this removes some of the salt from the ham). 2. Roughly chop the onion and peel and slice the carrots (you wont be eating them, so it doesn't matter how!). 3. Return the ham to the pan, adding the carrots, onion, cinnamon sticks and black peppercorns, and once again cover with water. Bring to the boil, and allow to simmer for roughly two hours. You will need to add more boiling water as time goes by, to keep the ham covered. 4. Drain and discard the vegetables. Allow the ham to cool slightly before trimming back the skin to leave a small layer of fat. 5. Score the fat with sharp knife, creating a diamond pattern. Stud each diamond in the center with a clove. 6. To make the glaze, place the sherry, honey and sugar in a small saucepan, and heat until the sugar has dissolved. 7. Pour a third of the glaze over the ham, and place the ham on a roasting tray in a pre-heated oven at 200 degrees Celsius. Roast for 10 minutes, then add half the remaining glaze. 8. Roast for a further 15 minutes and pour over the rest of the glaze, before returning to the oven for a final 20 minutes. Rest the ham for a few minutes before carving and serving with winter vegetables, or my healthy Sweetcorn & Red Onion Salsa. Alternatively, store in the fridge ready for delicious roast ham sandwiches!